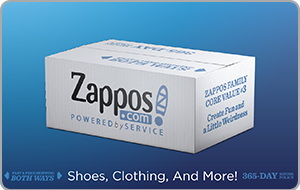 The Zappos.com e-Gift Card can only be used online at Zappos.com. e-Gift Cards will not be replaced or refunded if lost or stolen. Zappos.com, Inc. and its affiliates are not responsible for lost e-Gift Cards. An e-Gift Card cannot be used to purchase Gift Cards or e-Gift Cards. Purchase amounts that exceed the value of the tendered e-Gift Card will require a credit card for the balance due. For full terms and conditions: www.zappos.com/c/gift-terms-conditions.